We lived smack in the middle of the valley, home to circuses, carnivals, horse trainers, and movie stables: Hudkin Brothers, George Spahn, Fat Jones, Ralph McCutcheon and Glenn Randall. All of these were my stomping grounds at various times, sometimes just hanging out, sometimes helping with the horses. My dad, John Kemsley, was known as the ponyman. He kept a herd of twenty ponies for his carnival and for movie work. Dad introduced me to the world of horses as soon as I could sit up. At six months of age, he put me in the saddle for the first time. That was the beginning of a lifelong love affair. The cowboys said I learned to walk when I fell off. That may be true. My earliest memory is of walking home from a nearby ravine after being dumped, once again, by my black and white pinto pony, Prince. I hated that walk and vowed to never get tossed again. It was a vow I could never quite keep, but it sure did improve my seat. Prince and I worked things out and began returning home together. I still feel more at home astride a horse than I do on the ground. One end of our circular driveway was directly across from one end of the circular driveway of Les Hilton–among the elite of movie horse trainers. Mr. Ed resided in the last stall on the left of his long, white shed row barn. At various times, several of the best known equine stars lived there. Black Diamond and Frances, the talking mule, were two that preceded Ed. The success of Frances was the inspiration for the television series where Ed was the star. While Ed lived there, the stall immediately to his right was the home of Pumpkin, his stunt double. Both of these charismatic palominos became my good friends. Ed dominated the barn, even though he was two inches smaller than Pumpkin. The sheer force of Ed’s personality dictated the daily routine. People weren’t allowed to say “hello” to Pumpkin first, or Ed would sulk, grabbing the short rope affixed to the top half of his Dutch stall door and slamming it shut. It didn’t do any good to apologize. Ed would be out of his stall and into his corral by then, hiding behind the barn and refusing to return. Ed demanded to be first in all things: the meals of alfalfa hay at sunrise and sunset, cleaning his stall, the mid-morning grooming, the noon ration of oats and barley, and even the afternoon training sessions. If Les brought new toys, Ed insisted on playing with them first. When fans visited, which was often since his trailer sat out front, Les greeted them cordially but was careful to steer them toward Ed and discreetly shoo Pumpkin away. No amount of coaxing would induce Ed to perform for fans if they stopped to admire Pumpkin. Ed was used to basking in the spotlight, having completed a career as a show and parade horse before becoming a movie star at age eleven. Born in 1949 and registered as Bamboo Harvester, Ed traveled throughout the United States, winning championships in prestigious arenas like Madison Square Gardens. I first met Ed at the Los Angeles County Fair in Pomona, still considered the largest fair in the world. Each year, the Palomino Horse Association (PHA), headed by President Jim and Edna Fagan, sponsored an exhibition barn. The Fagans owned Harvester Farms, now honored as Los Angeles County Arts Commission Historic Cultural Landmark #645. Their foundation sire, The Harvester, was Bamboo Harvester’s grand sire. The Harvester and his get were prime exhibits in the PHA barn. People wandered through the barn, admiring each Palomino in turn, and many would gather in front of Bamboo Harvester’s stall, which was lined with trophies and ribbons. Like his grandsire, Bamboo Harvester was entered in the famed Pasadena Rose Parade many times. Acceptance into the parade is by invitation only, which makes the honor all the more prized. Needless to say, the horse barns at the county fair, especially the palomino barn, was a favorite haunt of mine. The Fagans were gracious hosts and seemed to enjoy my enthusiasm for their beautiful horses. Harvester Farms in Chatsworth was not far from my home in North Hollywood, and the Fagans were kind enough to invite me for a visit. Their basilica styled barn was filled with golden champions and future champions. We spent quite a bit of time watching the trainer work his charges and an equal amount of time pouring over photo albums in their trophy filled den. After I moved to Sylmar in 1963, I purchased a palomino quarter horse yearling. The Fagans were helpful in obtaining his registration in the PHA and providing me with show and meeting schedules for the association. Bamboo Harvester was purchased from the Fagans by Mr and Mrs. Carl Wood, who also exhibited him. In 1960, Carl sold Ed to Les Hilton for the sum of $1500 over his wife’s objections. Ed, who was still a stallion, was immediately gelded. As soon as he recovered, Les began training him for the series pilot due to start filming in five weeks. Pumpkin, younger by eight years, was content to play second fiddle. As a three-year-old, his babyish interests were different than the well seasoned Ed. Pumpkin lacked the worldly demeanor Ed found so natural. He preferred to romp free in the arena behind the barn. During the training sessions, Pumpkin was as likely to play as he was to work. Not yet understanding the importance of exact timing, Pumpkin tired to shorten the training sessions by anticipating Les’ next commands. This was fortunate for me. Les asked me to be Pumpkin’s assistant trainer. By working for two people, it would make it harder for him to anticipate the routines. A young teen, I was thrilled to be handed this honor by a trainer of Les’ caliber. To say I was diligent would be an understatement. I was as overzealous as Pumpkin, wanting to please Les in any way possible. Our combined enthusiasm must have been a source of amusement to Les. For many years, I’d watched, shy and silent, from Les’ fence, intent on capturing every detail of his training methods and their results. Once I was sure I understood, I’d practice on Dad’s ponies until I could duplicate the tricks and performances. Les, also a person of few words, didn’t seem to mind his quiet disciple. He never asked me to leave and sometimes appeared to exaggerate his cues so I’d be sure to learn them. Shortly before Les asked me to work with Pumpkin, he remarked on a favorite small horse, Diamond, I trained. “Whoever trained that pony did a great job.” Higher words of praise could not have been spoken. They ring in my ears even today. Cueing movie horses is an art in itself. The cues must be subtle and yet visible from a distance so the trainer and his shadow remain out of camera range. Movie horses are always focused on the trainer. If the trainer is in the wrong place behind the camera, the horse appears to be looking in the wrong direction on screen. To keep the apparent focus right, Les had to be able to work from every angle and from behind huge lights and other bulky equipment. Cues also must be silent, contained in hand and body gestures rather than words. Stars like Ed must be able to work at liberty, with no restraints from bridles, halters and ropes. Les was a gentle, methodical trainer. He communicated well with horses and understood what inspired them to excel. He started his horses with word commands and body movements designed to excite the horse into doing the desired action. As soon as they responded even slightly, he’d stop and praise them, sometimes using carrots as a reward. This encouraged them to try again, becoming bolder in their response each time they were rewarded. Once they knew the trick or sequence thoroughly, Les began replacing the word commands with physical cues. Les used whips as cues but never whipped his horses. The whips were an extension of his arm, indicating which way to look or move. They were also used to tap the horse in the beginning stages of a trick. This led the horse to understand that a whip pointing at his leg would mean to move the leg. Specific movements meant specific things. A whip suddenly raised high meant to rear. A whip held to the left, with the tassel shaking, meant to look to the left. Rufus Riddlesbarger of the Lanteen Arabian Foundation imported the great Antez 448 from Poland especially to cross on Palomino mares. A Saddlebred-Arabian cross, Ed was foaled in El Monte, California, a son of Chief Tonganozie and a grandson of The Harvester, a founding sire of The Palomino Association whose distinctive silvery tone shimmered through his golden coat and was passed to each of his descendants, including Ed. His dam was Zetna, who was imported from Poland, as was her sire, Antez. Pumpkin’s gold was slightly darker, the color of a newly minted gold coin. However, the most notable difference between Ed and Pumpkin, a registered American Quarter Horse, was the golden pumpkin in the center of Pumpkin’s blaze. When he was standing in for Ed, this moon was covered with white make-up. 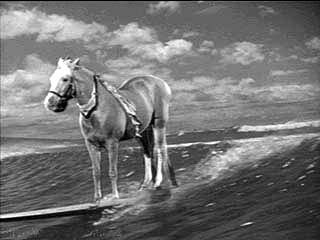 Years later, Pumpkin starred in the Snak-Pak commercials as a talking horse–a direct result of his training by Les. In the Snak-Pak commercials, his golden pumpkin was fully visible. He also played a horse who claimed to be TV”s “Mr. Fred” in a 1969 Green Acres episode. 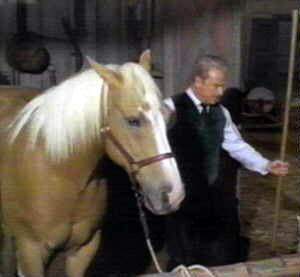 Filmways Productions produced both Green Acres and Mr. Ed. One of the most frequently asked questions is: How did Ed talk? That was a closely guarded secret so as not to disillusion the public. I know Les would share the secret if he was still alive, but even though it’s been more than forty years, I still feel uneasy breaking the pledge I made to Les. However, it is time for others to know how this gentle man worked this magic. It wasn’t with peanut butter, as is often imagined. Peanut butter would make a horse use his tongue excessively but would not affect his lips, much like a person trying to get peanut butter off the roof of their mouth. If peanut butter was placed under his lip, it would have been visible on camera because Ed’s lips were very agile, a trait often found in Arabian horses. Les first trained Ed to move his lips on cue. This took patience and rewards. Ed liked the attention so much that he wouldn’t stop “talking” on cue. He’d keep going until Les walked away. To overcome this, Les had to devise another method. Fans have noted that Ed always appeared wearing a halter. Some fans even spotted a slender line running from the halter to a place off-camera. They interpreted that line as a cue to move his head. The line had another purpose. It ran from halter ring to halter ring, passing under Ed’s upper lip. Les would gently wiggle the line to cue him to talk and stop talking. It was hard to spot on camera, although not impossible as those alert fans proved. Ed was virtually unflappable by noise and commotion.This was important on the movie set where crews would be dragging equipment and cables virtually under his feet. One of Ed’s best qualities was his ability to concentrate despite the confusion and noise on the set. Before the camera rolled, Les would practice the scene with Ed. Once the cameras were rolling, Ed would perform as directed, usually only needing one take. By far the most appealing trait Ed brought to the show was his personality. He loved attention and would perform for long hours as long as he was the star of the show. This vanity was evident in his scenes. Off-camera, he was the same as the horse everyone grew to love on-camera. In front of Ed’s stall were all the familiar props from the movie set: the table with the telephone, the pencil for dialing, the sunglasses and others. When Ed wanted attention, he played with the props until someone noticed. Most new props and tricks were learned on the set. Les would walk him through the stunts a few times, until he was comfortable with the routine, then the filming began. Usually the scene was shot in one take. The majority of Ed’s tricks were variations on picking things up with his mouth. This trick could be parlayed into unlimited scenes with various props and combined with other movements. Ed followed Les commands exactly, looking always to the whip to learn what Les wanted next. One day, I was riding my horse, Diamond, and stopped by to see Les. A friend, Maggie, was riding with me. Les asked us to stand in two spots in the arena. In a third and fourth spot, he put a barrel, emulating a baseball diamond for the now famous Dodger baseball episode with Leo Durocher. As we stood there, Les intstructed Ed to canter around us using only hand and whip cues. Ed never faltered or changed speed. He always watched Les. The viewer, if they were alert, could watch Ed’s eyes and ears and tell where Les was hiding behind the camera because Ed never stopped watching him. The only trick Ed disliked was hitting a baseball with a bat. Ed had to hold the bat in his teeth. He didn’t like the way it felt when the ball hit the bat. Les asked me to help him with this trick because it took two people: one to stand beside Ed and encourage him to hold the bat, the other to pitch the ball. Ed finally gave in and hit the ball on cue, mostly because he was bored. He knew we’d quit once he did the trick we wanted. Ed never saw the ocean, which was simulated by special effects. Another trick that amazed fans was Ed riding a surf board. This stunt was relatively easy to train. Ed was used to riding in horse trailers, which don’t have the best shock absorbers and sometimes have none at all. Ed was accustomed to having a floor moving and bouncing under his hooves. The hard part fell to the prop men who had to create a realistic “surf board” that was strong enough to hold his weight, which was over a thousand pounds. Ed trusted Les, and Les trusted the skill of the propmen. Even so, he worried that the “surf board” might not be strong enough when Ed stood on it. Fortunately, the trick went off without a hitch. Pumpkin followed in Ed’s footsteps, learning all the same tricks in preparation for replacing Ed when needed. As part of this training, he was often on the set, learning to be relaxed around the commotion inherent in setting up the scenes. Pumpkin appeared in the series only once when a shot was required from above Ed’s back. Being a quarter horse, Pumpkin’s backline was rounder and more flattering in the camera lens. Ed was patient, letting cameramen, electricians and propmen work around him. Often they dragged electrical cords, ropes and other paraphernalia under and around him. Pumpkin had a hard time learning to be that cavalier. A younger horse with little experience, these antics worried him. However, as he aged, he became calmer. One sign of this was being the horse selected to appear as “Mr. Ed” in the Hollywood Christmas Parade. Ed had to be on the set early in the morning, and Les worried the late hour of the parade on Sunday night would interfere with his performance on the set. The public did not seem to notice the switch, and Pumpkin handled the ride down Sunset Boulevard quite well, despite the noise from the crowd. 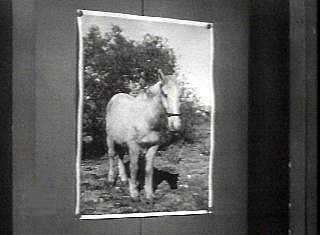 Nicker as Ed’s mother in a photo on Mr. Ed’s stall wall. Episode 13, Ed’s Mother, aired on March 21, 1961. In the story line, Ed found his mother at an old farm auction, bought her and brought her home, causing more problems for Wilber. Ed’s “mother” was played by our horse, Nicker, a palomino gelding. Nicker was brought to us for safe keeping when his former owner left for Alaska, promising to return at the end of summer. We never heard from him again. A patient and gentle eighteen-year-old Thorobred cross when he arrived, his background included both parades and horse shows, although not at the same level as Ed’s career. Nicker taught many beginning riders; he also romped and played with more experienced riders. He was in his 20s when he played Ed’s mother. Older thorobreds often look ribby, with large bellies and high withers. Nicker was no different and his lean, almost gaunt look suited his character just fine. His role was filmed in two days on the set. Patsy Awards are Oscars for Animals. Ed garnered first place in 1962 and again in 1963, 2nd place in 1964, then 3rd place winner in 1965 for the “Mister Ed” series. Animals of all species vie for the honors. The horse people, including my family, moved away from Saticoy St. in the mid-sixties. The land was rezoned to commercial, forcing out this amazing group of animal lovers. I read in the paper a few years later that Ed had been put to sleep due to arthritis. It was a sad day. Arthritis is not only painful for horses but a severe problem. Their legs are vulnerable at all times because they are so small compared to the weight they carry. When arthritis strikes, it can cripple them completely. They become afraid to lay down, lest they can’t get up again. A horse that can’t get up will die a slow death and can injure themselves while thrashing around trying to rise. I didn’t question the need for this humane act but couldn’t help crying for my old friend. I miss him still and treasure the memories Les, Ed and Pumpkin left behind. I thoroughly enjoyed reading every word of this! What a wonderful story. Thank you! Now, off to find some Mr. Ed video clips. It’s been a long time since I loved Mr. Ed in the 60’s. Hi, Zen Doe, it’s good to see you here. I’m glad you enjoyed my reminiscences. The SFV was a wonderful place to grow up and just as fun in memory. Hi Loretta, I’m here and really enjoyed the story. Mr. Ed, Francis the Talking Mule, what memories you have. It brought back some for me as well. Saticoy St…Wow, I haven’t heard that in years. Glad it jogged some memories of your own. I can still see everything about that neighborhood in minute detail. That amazes me because I couldn’t tell you the same details about my home or even in my bedroom. Of course, I spent more time with horses than indoors, so I guess that shouldn’t surprise me. What wonderful memories for reminiscing. I, myself, have 40 years of reminiscing with Francis, the Talking Mule!! Thanks for the history of Mr. Ed. I grew up in Northridge during the 60’s and 70’s. We had a few horse ranches in Northridge. I remember a place called Western Ho on Devenshire. I think Chatsworth had more horse ranches. My friends uncle also ran a feed store in Chatsworth. It was fun to grow up in the Valley and Mr. Ed was a great show and it is still funny in reruns. Loretta……Thanks for all the insights into this wonderful animal. This is an outstanding description of the history of behind Ed and Pumpkin. 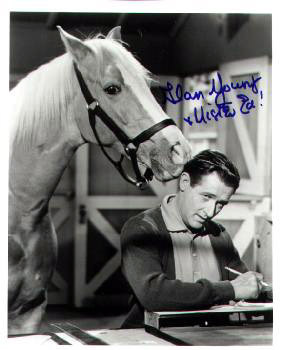 I know that my uncle, Allan Rocky Lane (the voice of Mr. Ed), loved those animals and had a great deal of respect for them. He was a horseman up until the time he fell ill. Thank you for giving us this background. We never knew about any of this. I LOVE the article information about Mr. Ed and Pumpkin. Are there any more stories about Mr. Ed that you can share. Do you have any color photos of Mr. Ed or Pumpkin together or any photos of your teenage experiences with trainer Les that you can post? Such a wonderful story, this is the first time I have seen this one. Les was my Great Uncle on my Fathers side; my Grandmothers Brother. I got be meet him a few times when I was young. He picked us kids up one day (My brother, sister and myself) and took us to be with him on a movie set in Southern Arizona. We got to see him in action filming Monte Walsh. He was a wonderful, gentle and sweet man. Thank you for writing this. Susie, so nice to hear from you. I feel the same about Les. A wonderful man. Feel free to share your memories with us. I’d love to hear what it was like on the set with him and anything else you think is of interest.